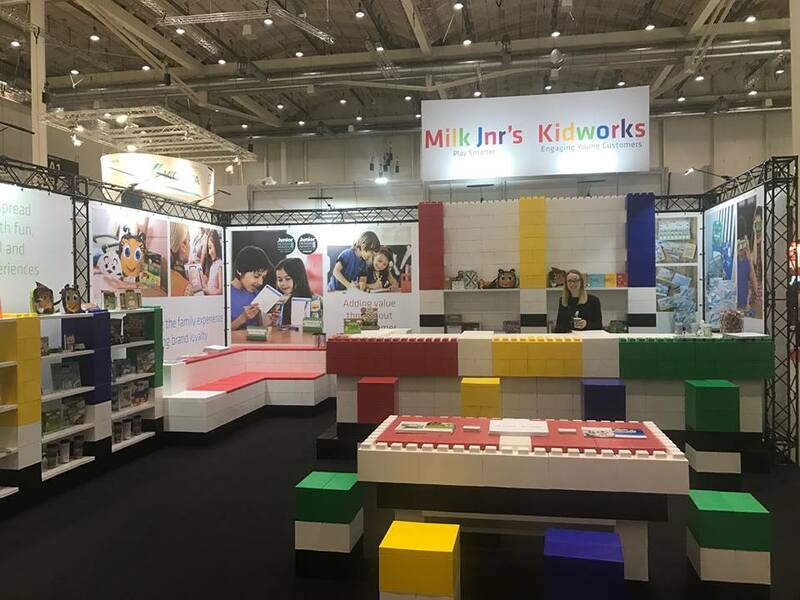 With EverBlock® you can build nearly any size trade modular show booth and create corporate branding solutions that are limited only by your imagination. 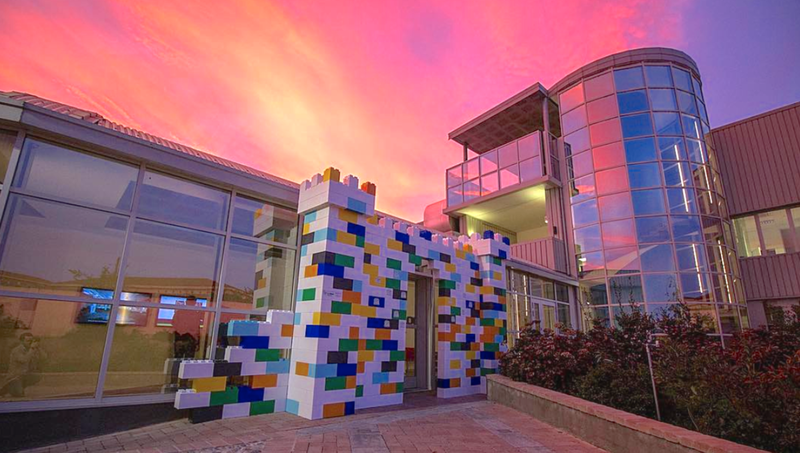 Finished EverBlock display at Urban Planning Institute conference in San Francisco (Courtesy of: Fetch Graphics). EverBlock trade show display for Google Fiber being built. Vinyl graphics being applied to Google Fiber booth at Urban Land Institute event. 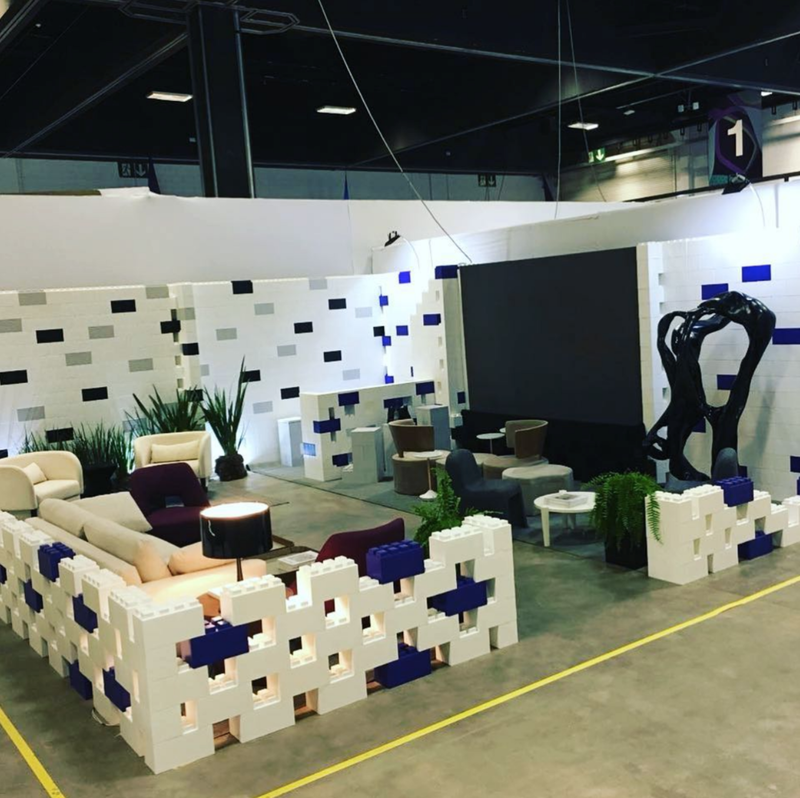 Using EverBlock, build intricate portable back walls, display niches, modular platforms, expandable podiums, ledges and all types objects. Run power within the exhibition booth wall for lighting, screens, and other accessories, or illuminate display walls with LED lighting strips to create dramatic visual experiences. Need different sized interlocking displays for different trade shows? No problem. 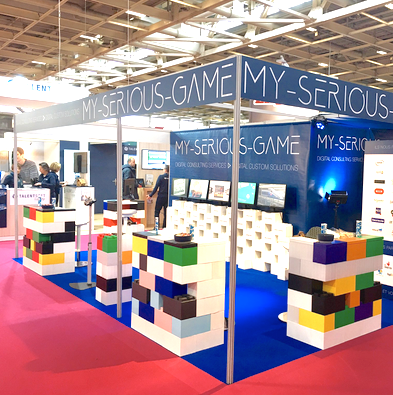 Everblock is modular, so you can reconfigure your display as necessary for the specific venue or exhibition. 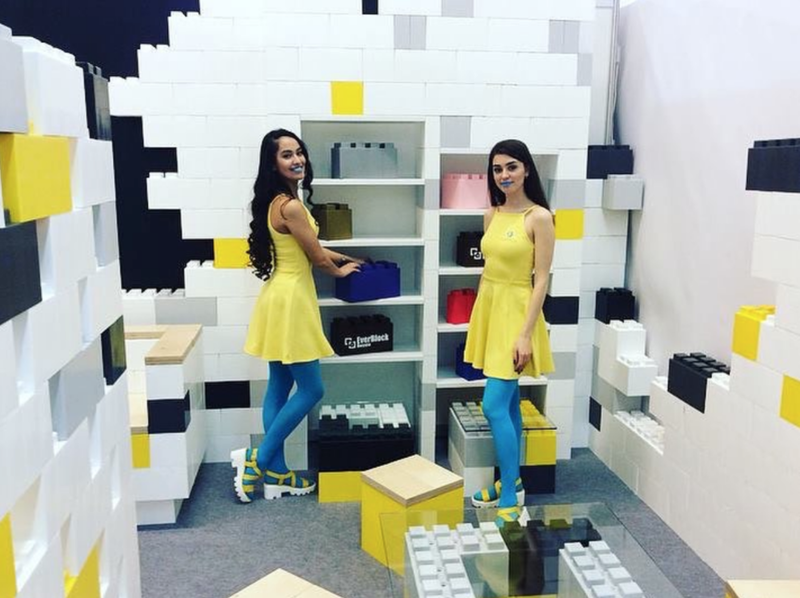 Because of EverBlock's unique modular block design, you can transport your custom trade show booths and portable exhibits compactly and efficiently, minimizing shipping and drayage fees. We offer rental and sale of a variety of colors, allowing you to mix and match as needed to meet event themes, match team or corporate colors and achieve your convention booth goals. EverBlock is durable enough to support TVs and other items. Hang signage and other finishing materials from block walls as needed (proper construction is required). 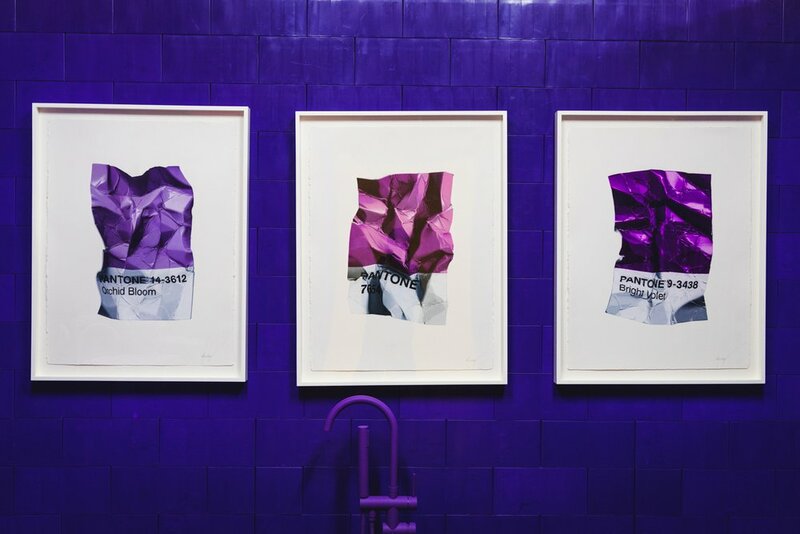 For an exciting visual effect, or to spice up your display, adhere vinyl printed graphics to the EverBlock. You can illuminate EverBlock from within and floodlight them from the front to create amazing effects. Check out our modular interlocking flooring systems, available in 16 colors and 4 wood patterns. Create beautiful modular exhibits and displays of all types. Use EverBlock inside or outdoors as blocks are waterproof and UV stabilized. Create unique looking displays that are modern and versatile. Expand and revise as needed for individual events. EverBlock is transportable on pallets and in boxes and is versatile, portable, and modular. 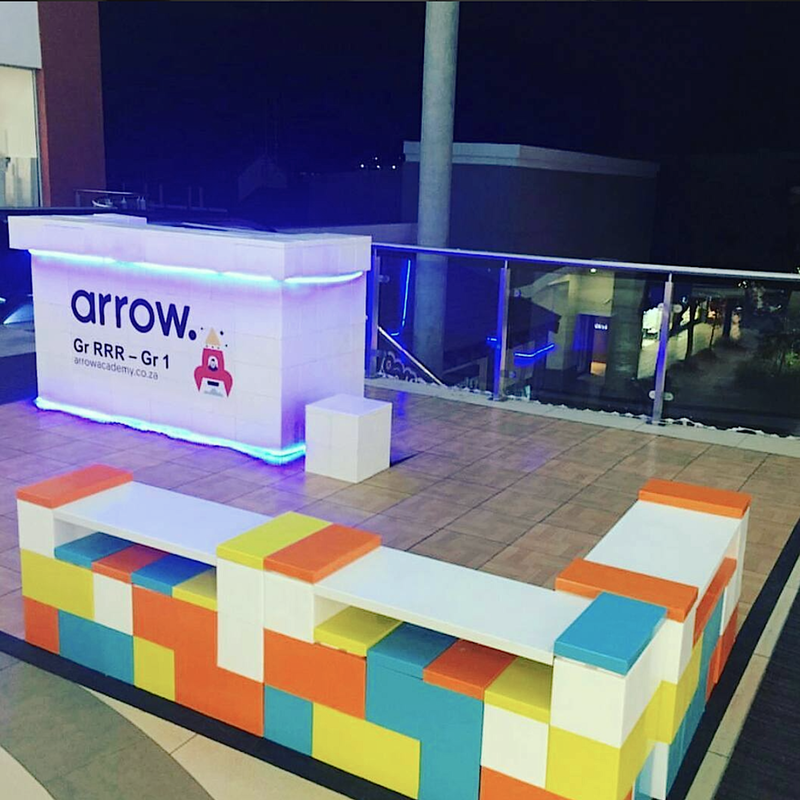 EverBlock is perfect for creating unique retail displays and for building customized store fixtures. Easily design tables, columns, display plinths, sales counters, display walls, backdrops, and nearly anything you might need for a retail store space. Build out retail spaces with modular display units that can be adjusted and reconfigured as needed. With so many possible configurations, what type of pop-up display or exhibit you build is up to you. No matter what you build, your modular display is always re-configurable, always stores and ships compactly, is incredibly durable, and can be used outdoors or indoors. You can add shelving units in various sizes to your EverBlock® modular trade show booth and can even hang objects from the wall. Compliment your display with attention grabbing EverBlock furniture. Use EverBlock for conferences, presentations, and other trade show uses. Photo courtesy of EverBlock's Japanese agent. Create attractive display plinths and pedestals for retail displays. 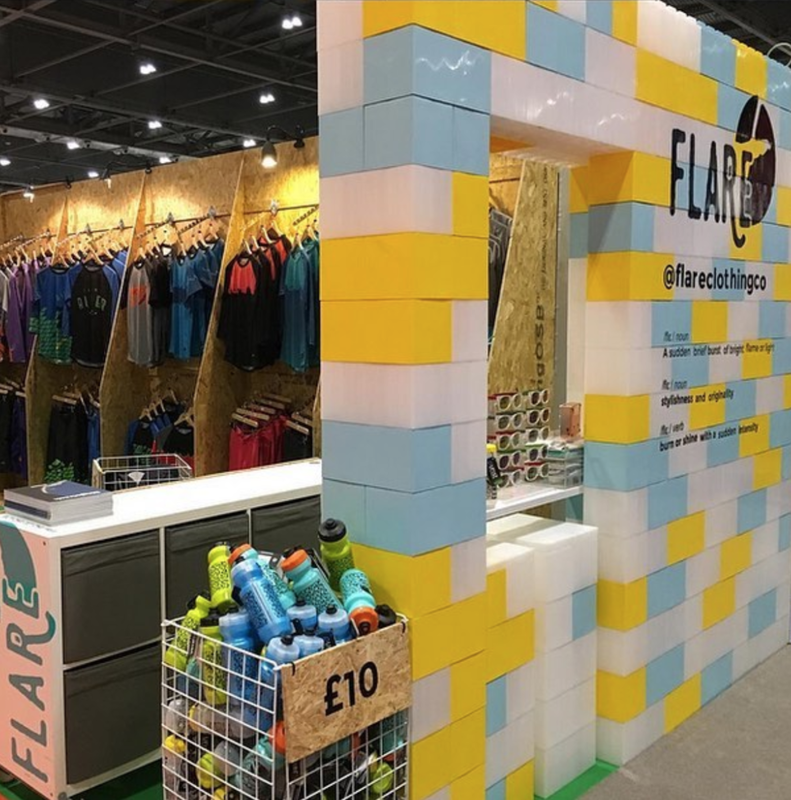 Use EverBlock to design eye-catching trade show displays that grab attention and draw visitors in. Build welcome desks and other counters. Photo courtesy of EverBlock's Japanese agent. Create exciting retail displays for exhibitions, pop-up stores, and high-end retail store. Use in conjunction with existing trade show backdrops. Create oversized and impactful displays that break down and transport on pallets. Use EverBlock to create simple platforms (see green platform in back), backdrops, and tables/counters of all sizes and shaped. Note illuminate accent in table and back wall. 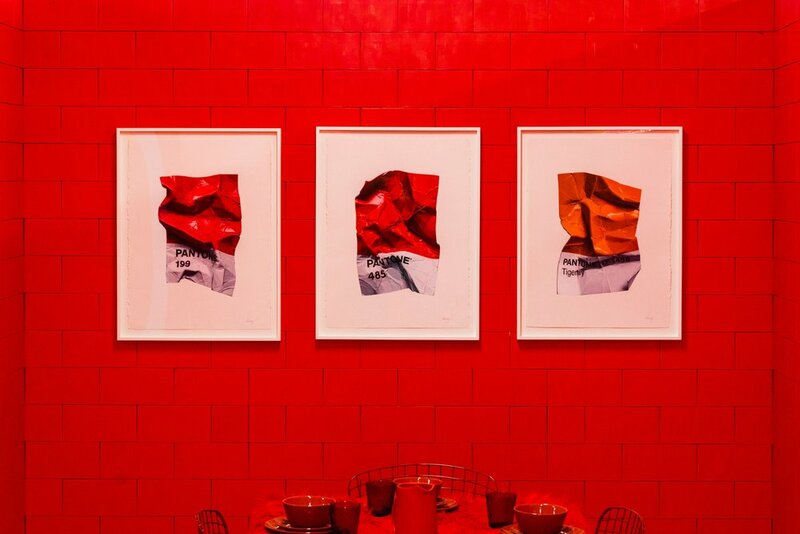 Use EverBlock® to construct moveable wall panels for art exhibition walls, art display panels, and art gallery walls. EverBlock sections connect easily in any length, width, height, or configuration required, and can then be demounted as needed and stored for future use. 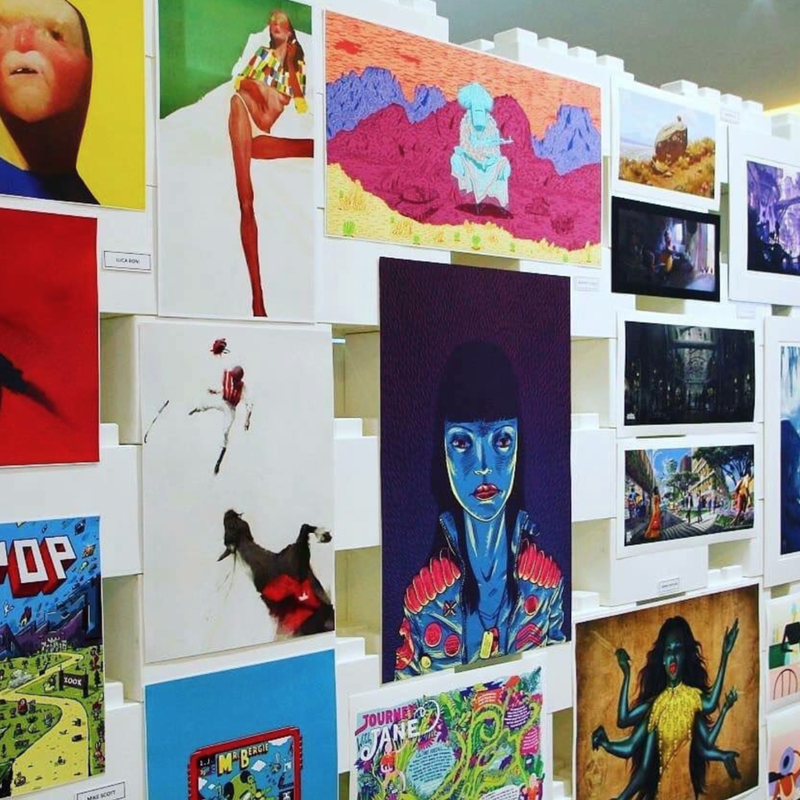 EverBlock art show walls can support the weight of heavy artwork and paintings and are designed to be free standing or to be connected to each-other at right angles as is desired for the design of the show. Select crisp White, or other colored walls to create the perfect backdrop for your artwork or choose from 15 standard colors for a more dramatic effect. Art display walls are available for purchase or rental as needed. 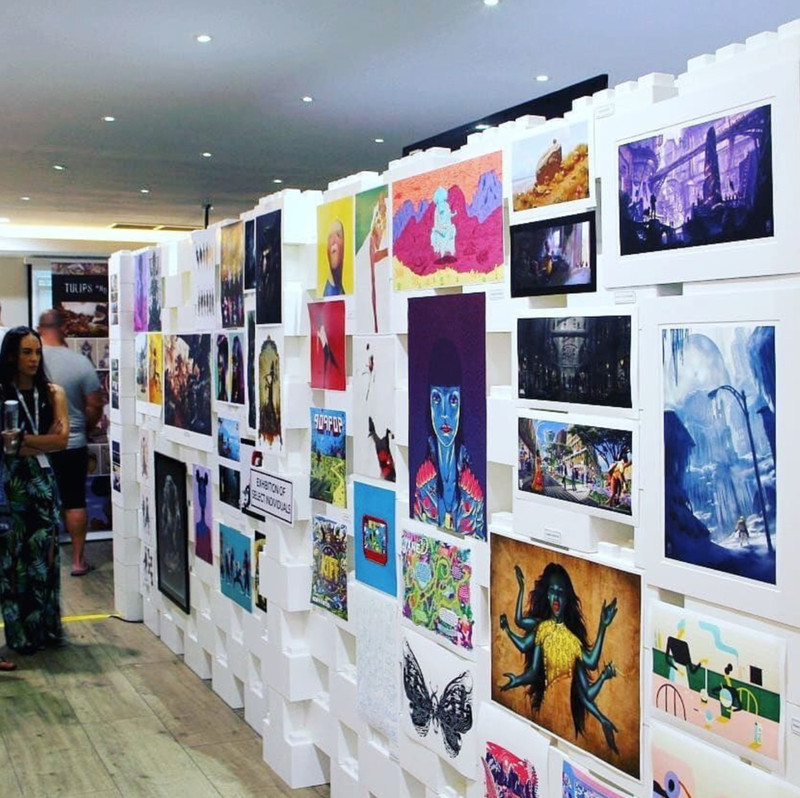 Create amazing temporary gallery walls for displaying art and customize your design for each venue or event site. Create amazing demountable walls that convey the essence of your brand and provide a dramatic backdrop for events, facilities, and retail spaces.